17 minutes of barely discernible audio recorded "in the field" in a KFC, McDonalds, Jack in the Box, etc., tho Turkington's droll, incisive, funny narration is again the star of the show. "as the population slowly becomes crazier and crazier" haha priceless. That's exactly what makes drive-thru's popular! How can I download this item? 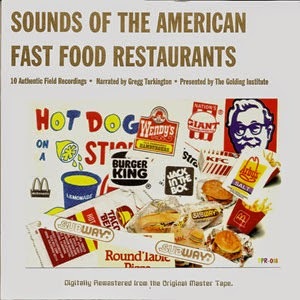 "The Golding Institute-Sounds Of The American Fast Food Restaurants (1996)", then click where it says DOWNLOAD NOW in the upper right hand side of the zippyshare page. Thanks much. Your blog is one of the best. This album seems amazing. I would have never knew this was even a thing, if not for stumbling upon it here. Your blog seems really cool because it doesn't just review the usual, run of the mill, albums. You are welcome as always, DJ Useo! And yes Blank, that is indeed one of the founding concepts of this here web-log.